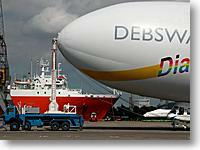 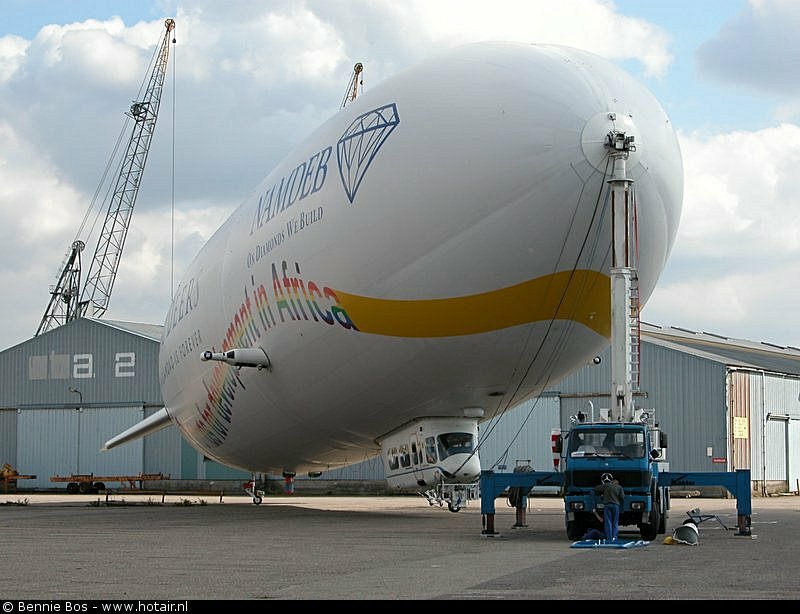 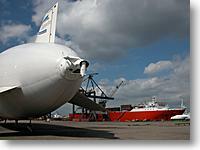 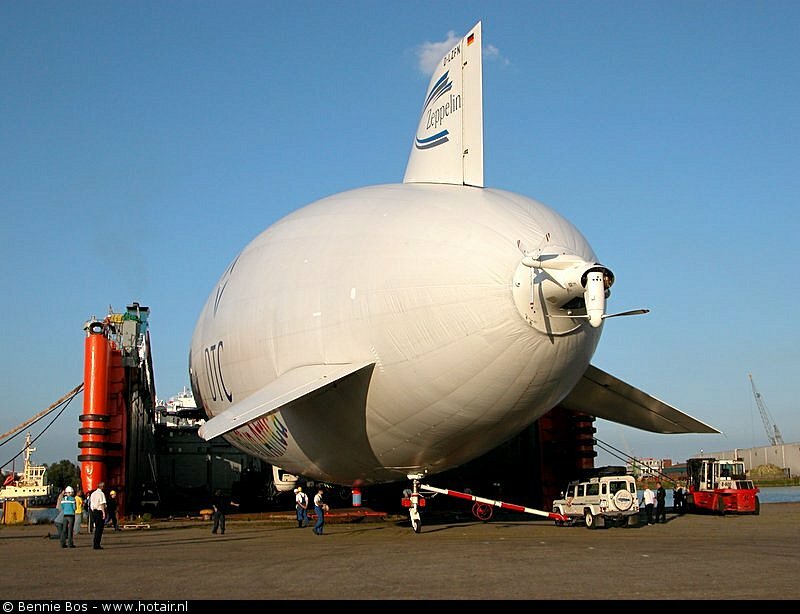 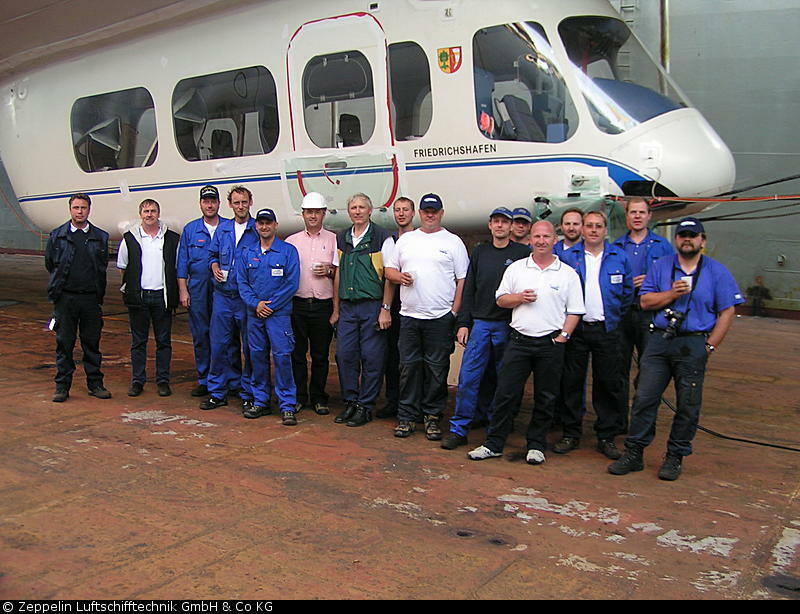 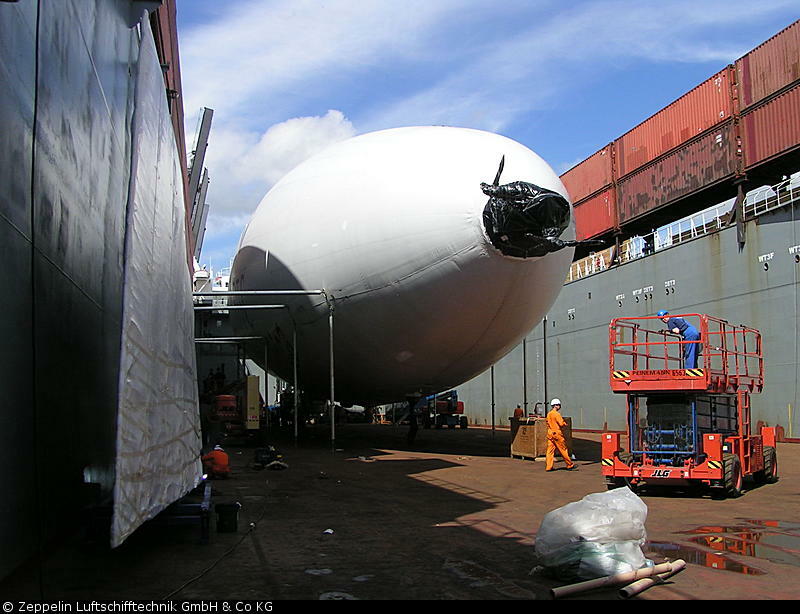 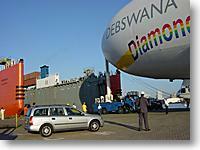 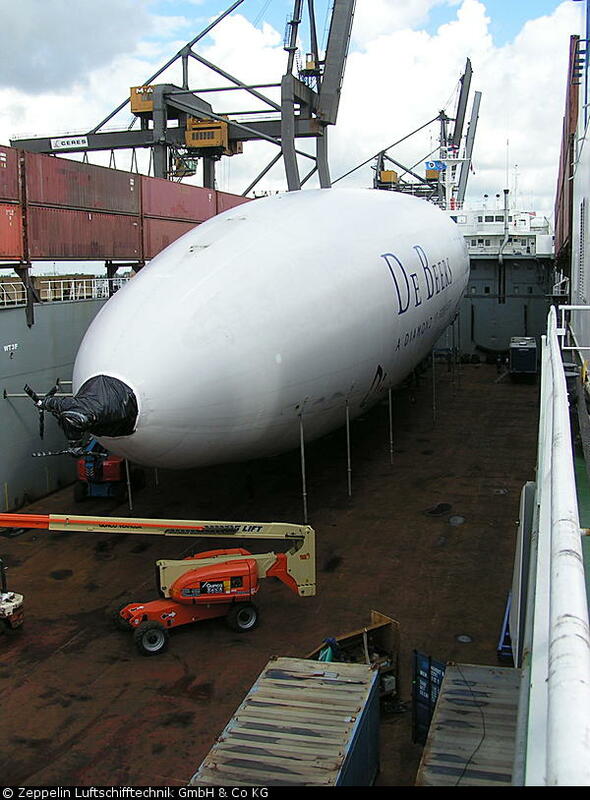 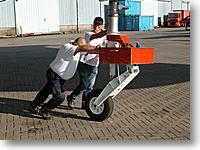 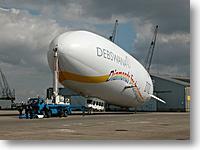 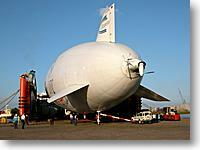 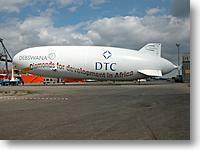 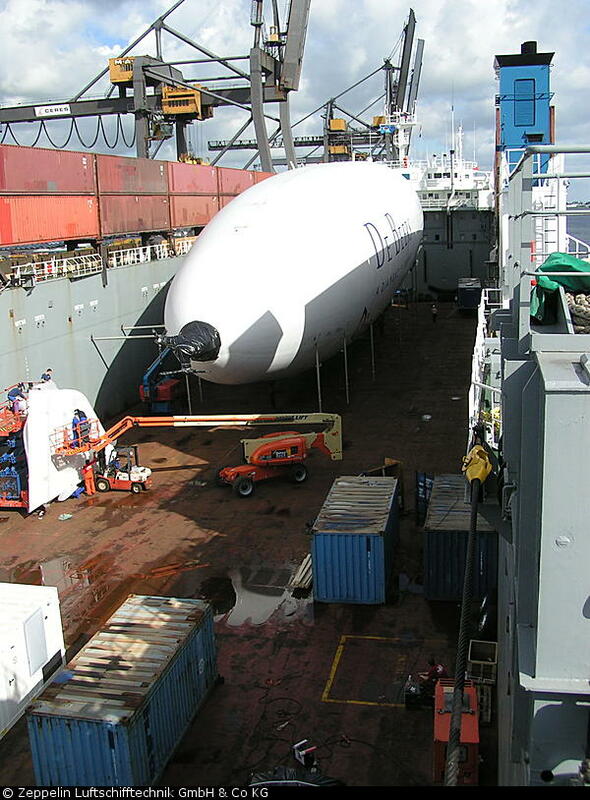 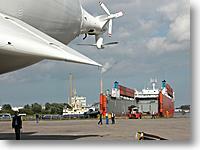 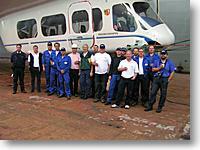 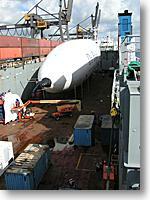 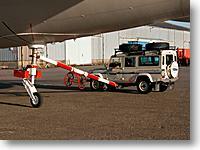 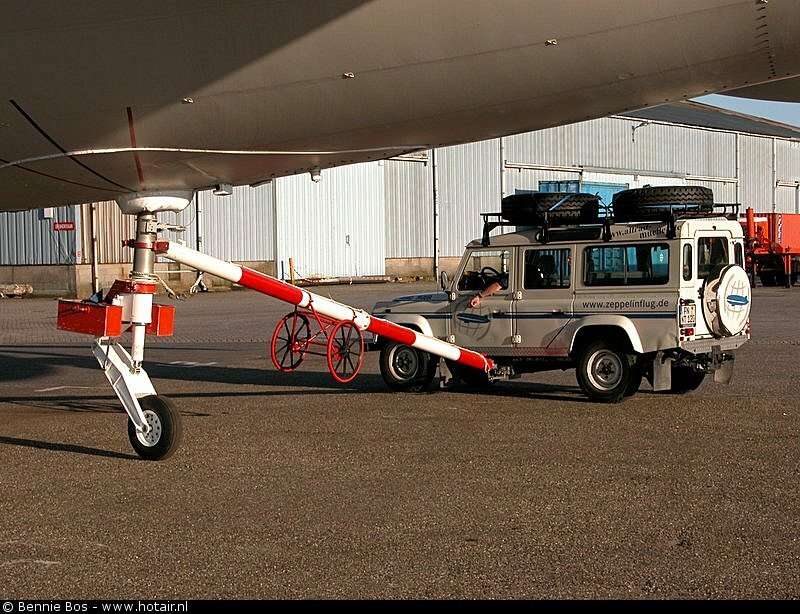 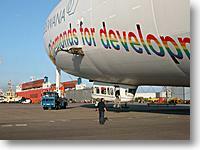 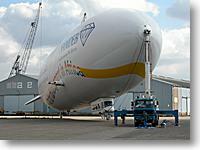 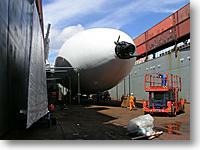 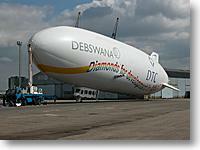 In August 2005 the Zeppelin NT prototype was shipped to South Africa for its new 2 year assignment with De Beers. 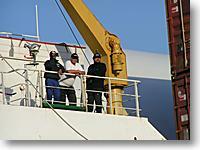 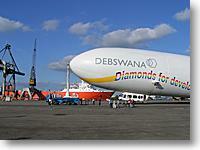 During its stay it will be used for several services for the De Beers Group. 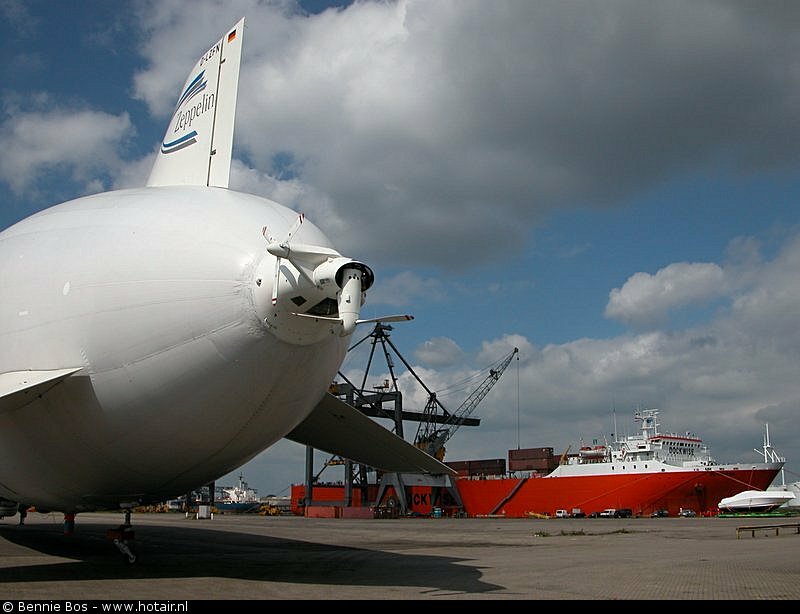 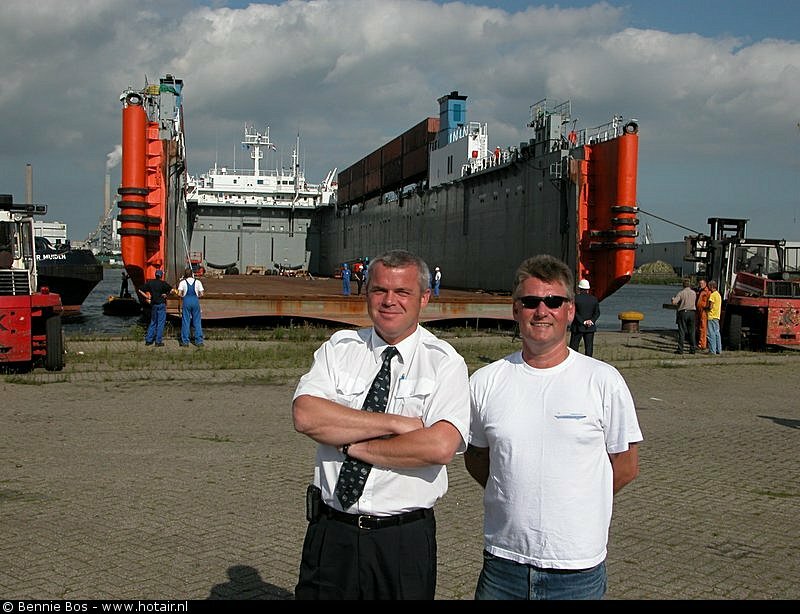 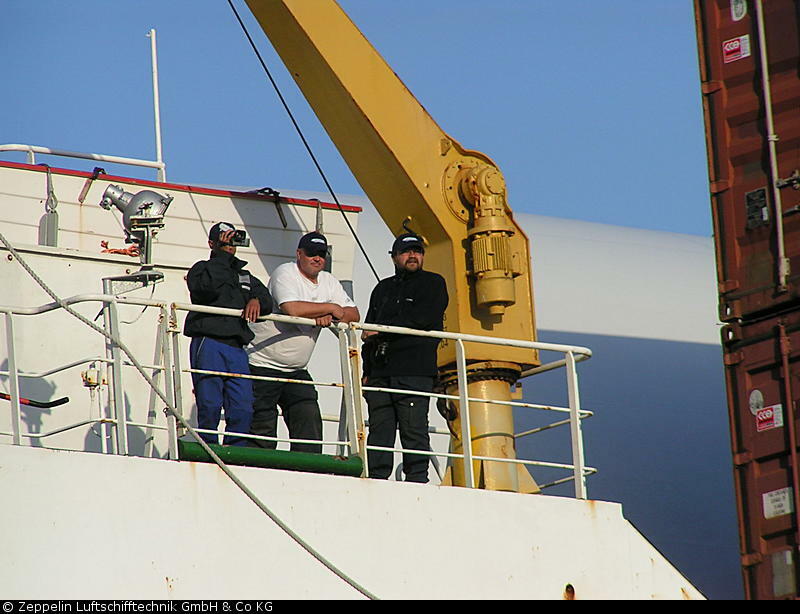 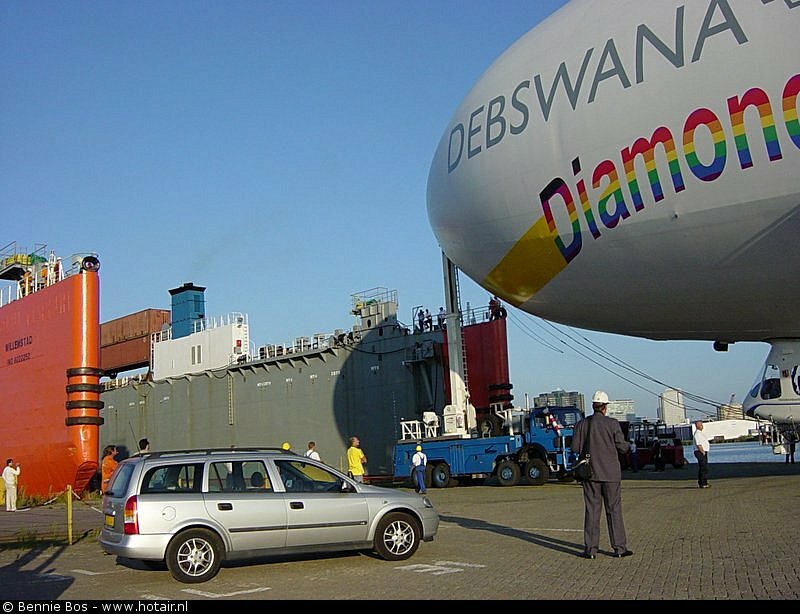 After flying from Friedrichshafen to Amsterdam it was put on the ferry ship in the same fashion as the Zeppelin "Yokoso Japan" which was shipped to Japan between December 2004 and January 2005. 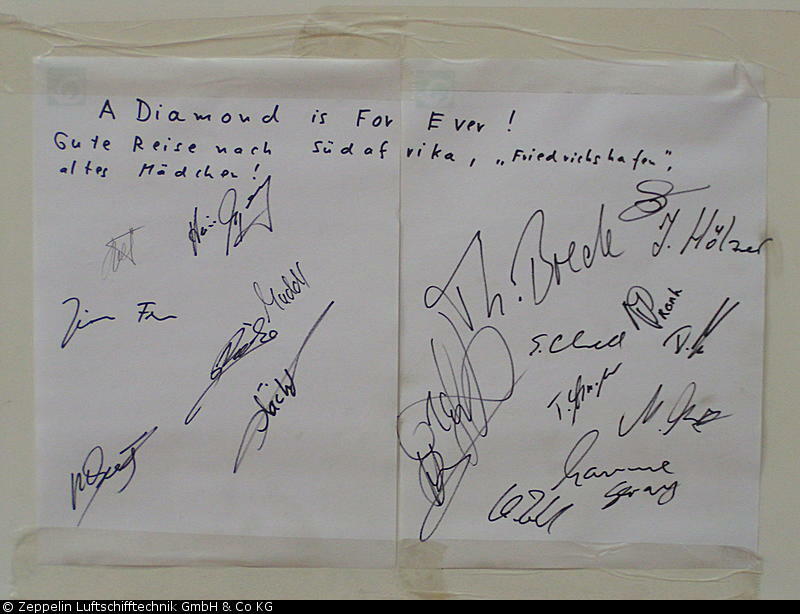 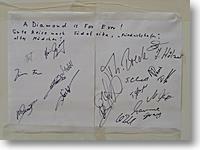 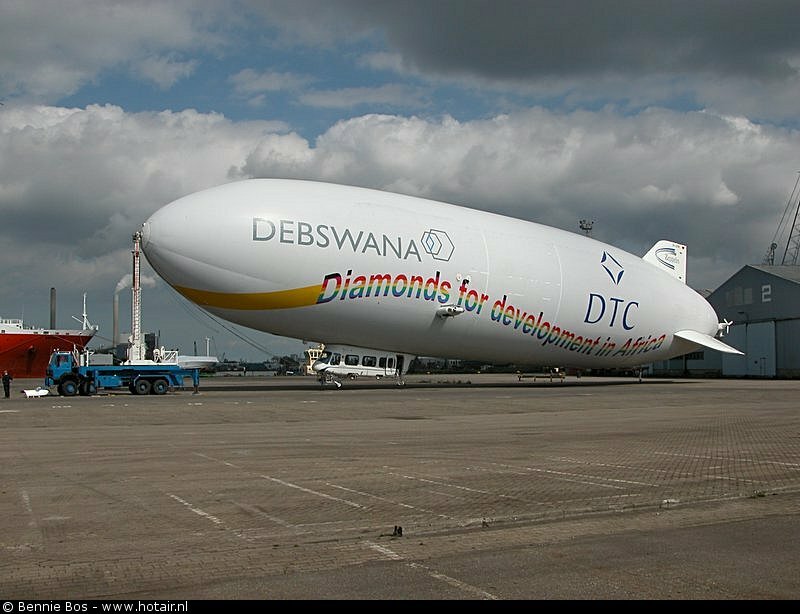 Main task of the Zeppelin will be the exploration of new diamond reserves in South Africa. 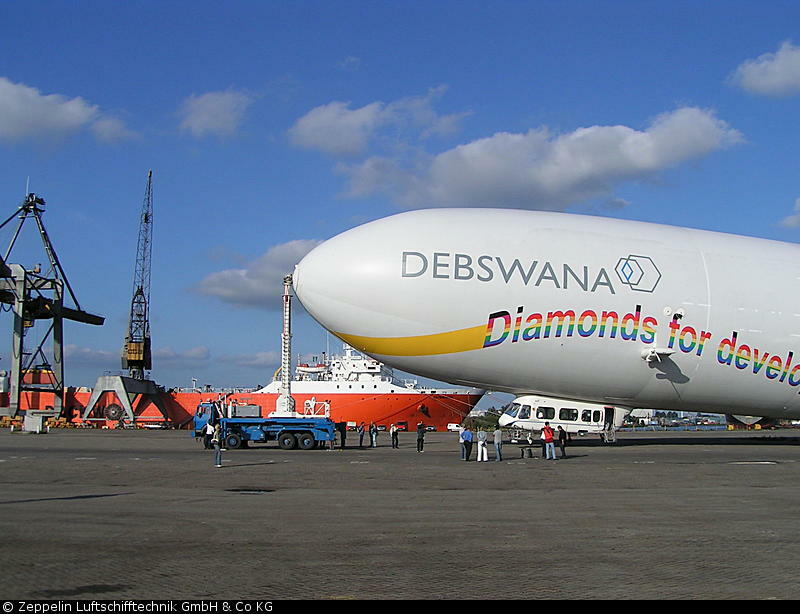 Currently De Beers is searching for new mine fields in Botswana but the old fashioned methods only showed up a limited number of new locations. 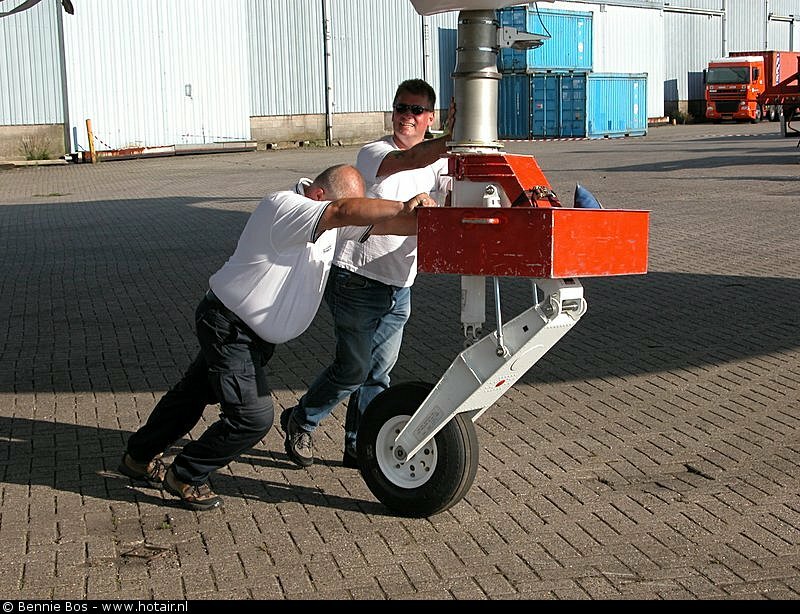 In the last years a new method, called gravity survey, was developed together with Bell Geospace which already shows promising results. 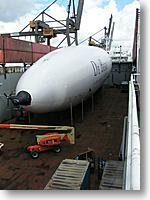 The Zeppelin NT will provide a unique platform for these explorations providing a five-time improvement compared to the current systems. 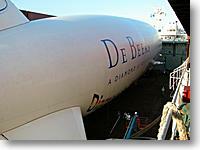 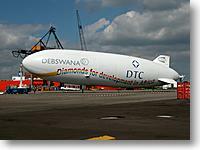 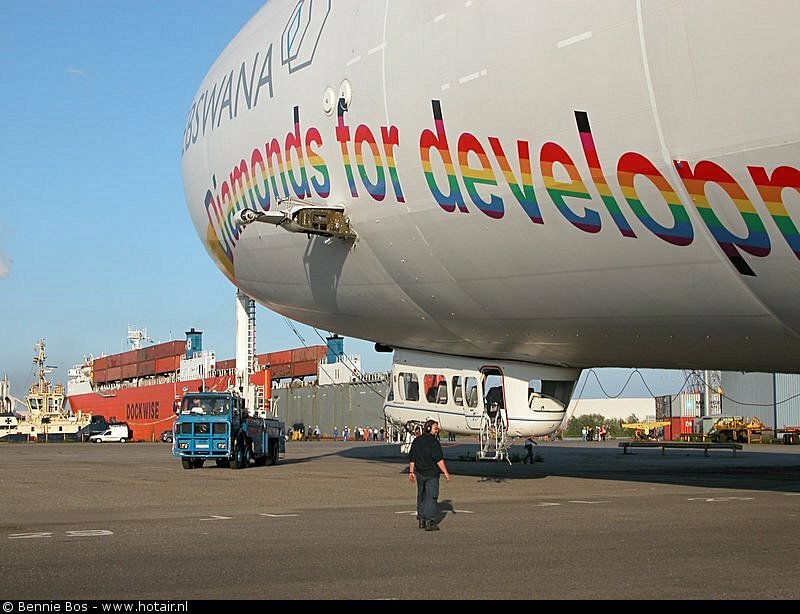 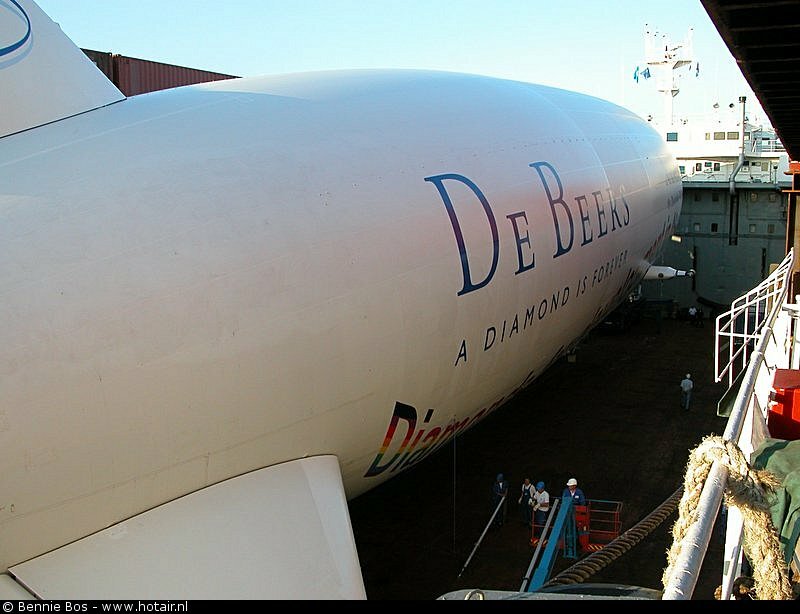 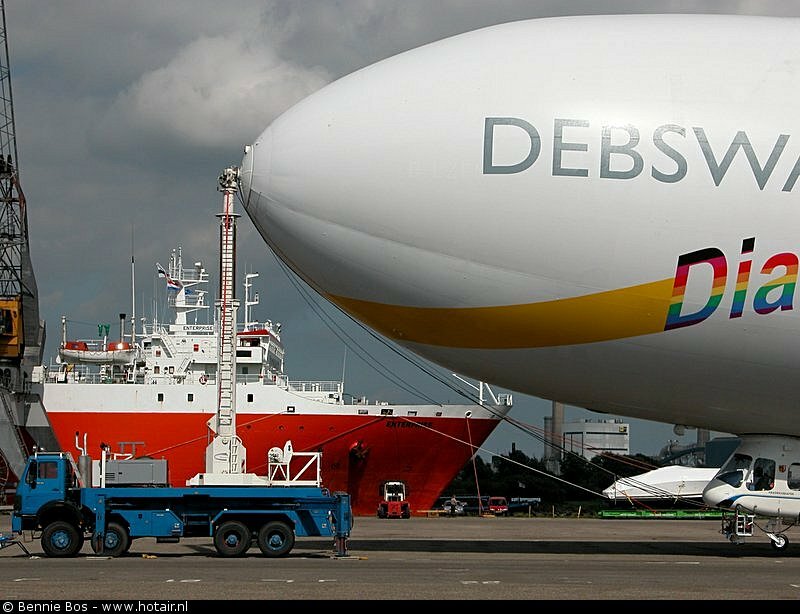 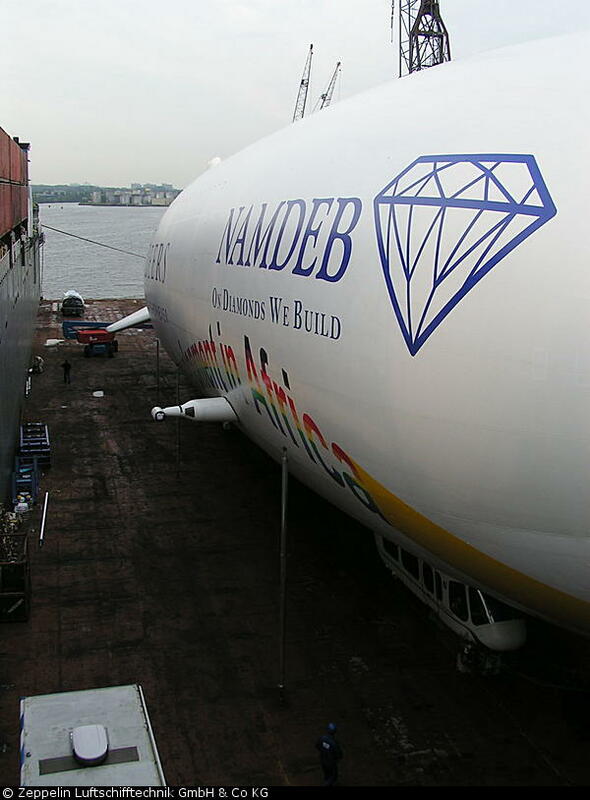 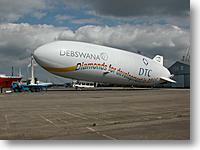 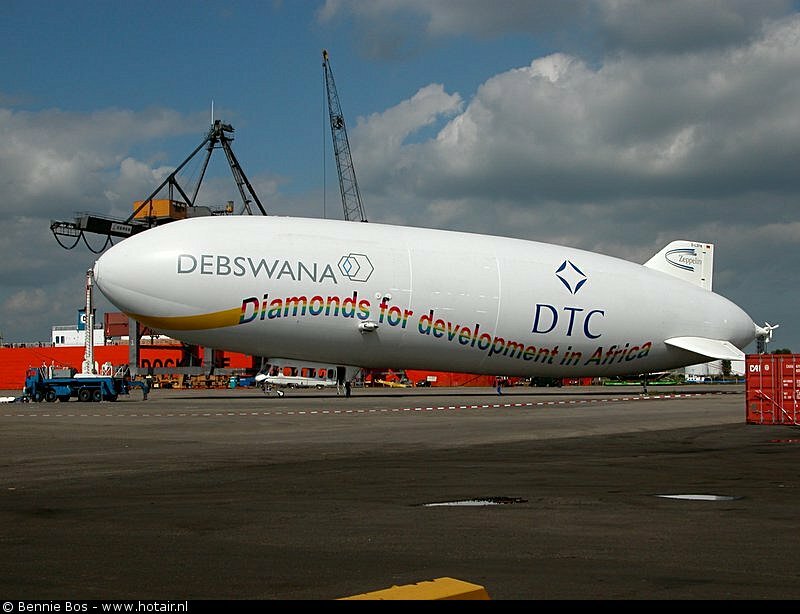 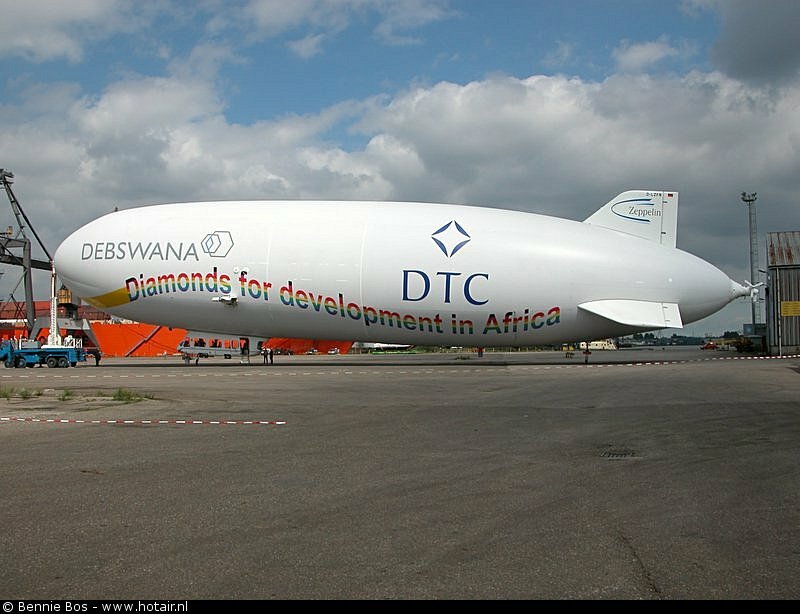 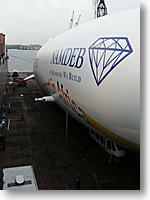 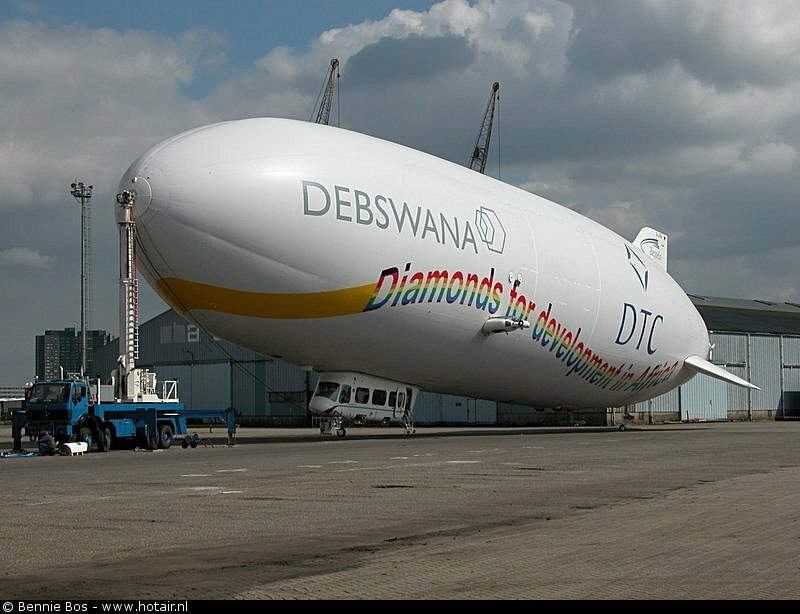 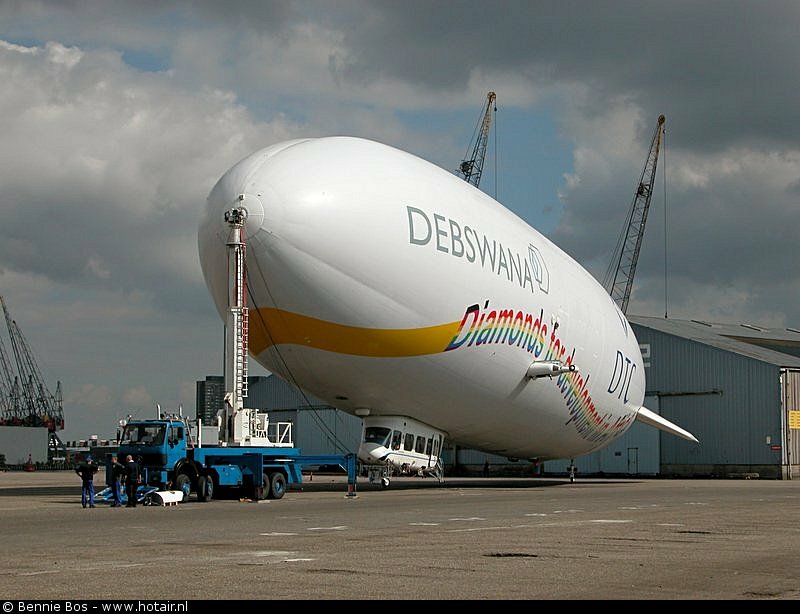 More information: Mineweb article: De Beers gets the blimp in. 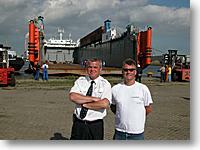 The photographs below are kindly provided by Bennie Bos from the Netherlands. 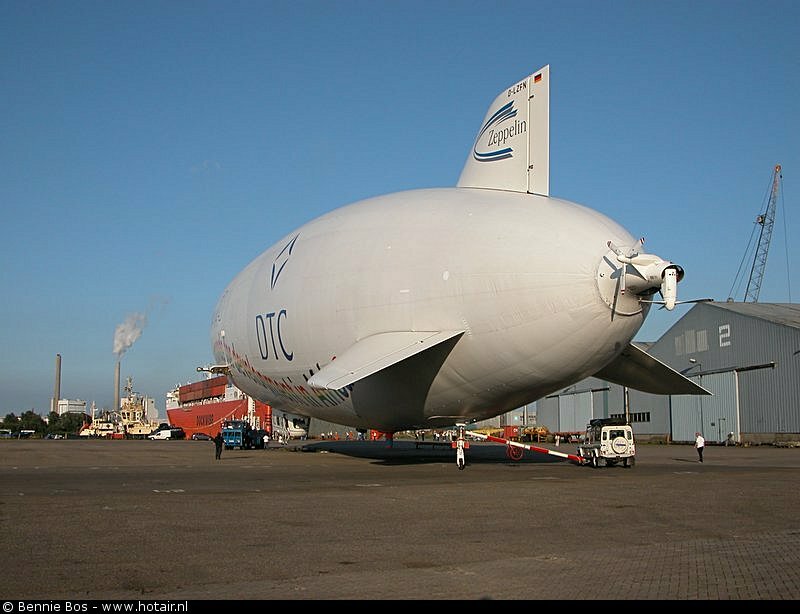 All of his great photographs of the Zeppelin NT and many more photos of balloons can be seen on his web page at www.hotair.nl. 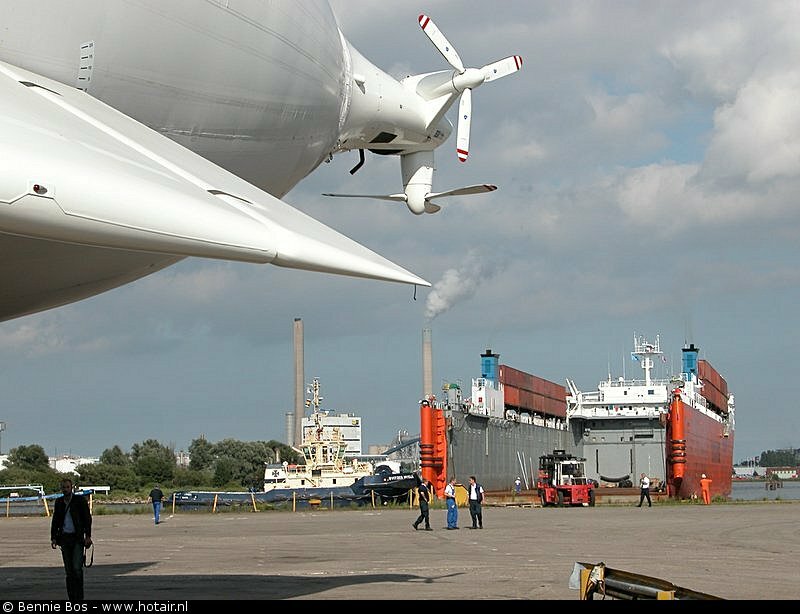 µ Photos: Bennie Bos, www.hotair.nl. 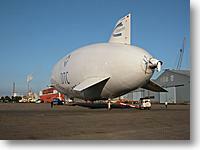 µ Photos: Press newsletter of the Zeppelin Luftschifftechnik GmbH, Friedrichshafen, Germany. 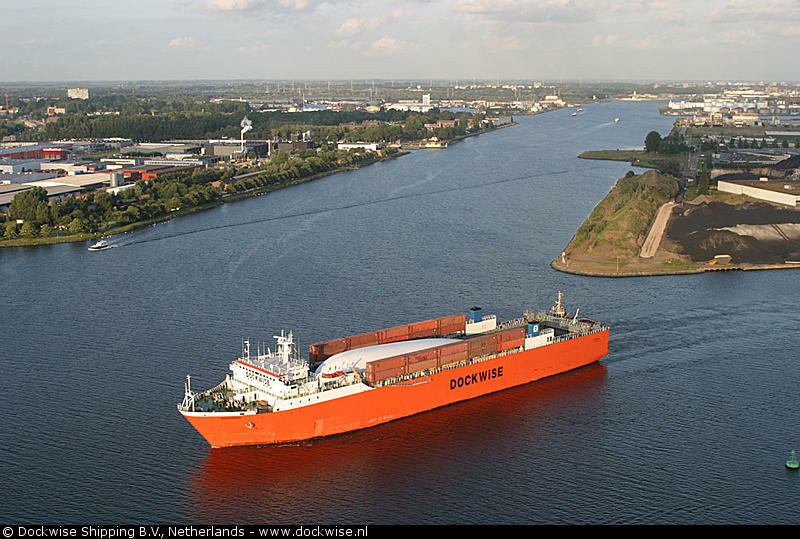 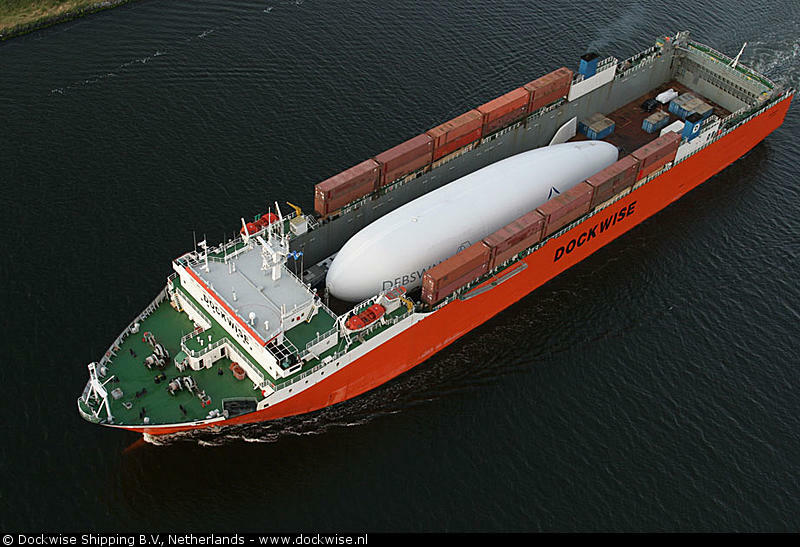 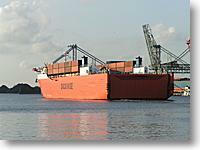 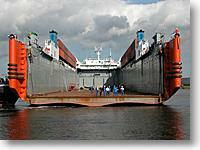 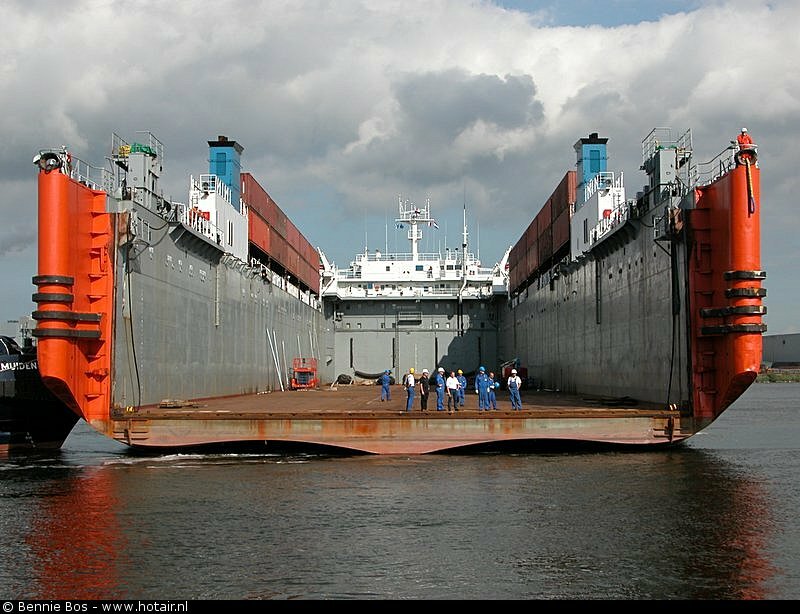 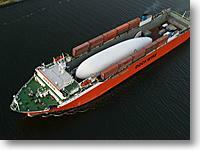 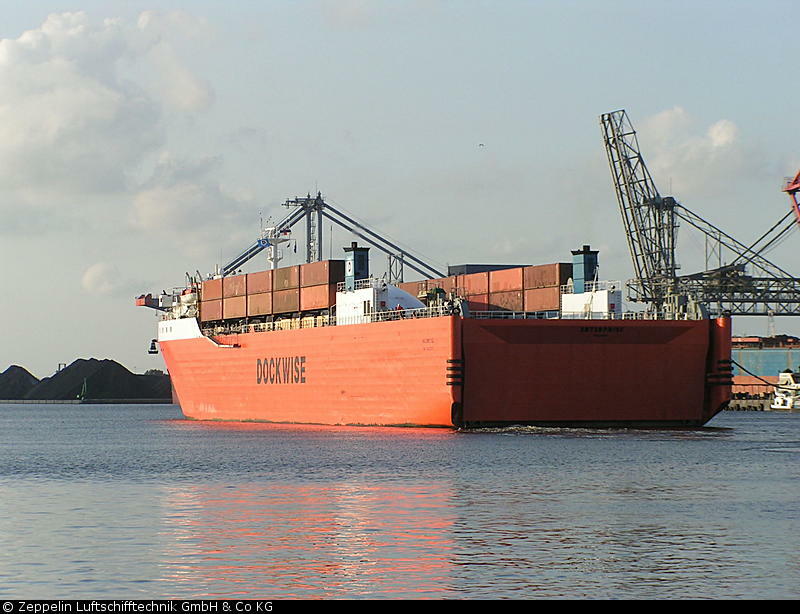 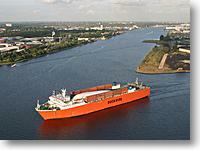 µ Photos: Press photos of Dockwise Shipping B.V., Breda, Netherlands.